Welcome to a very lucky number edition of Waiting for Wednesday. It's a weird week on my end, mostly because I'll be out of the office tomorrow, and I'm in a mad dash to get things finished up before day's end. So, there won't be much preamble from me today. Instead, I'll use this (coveted) space to (shamelessly) plug our Twitter page. Despite the fact that, for the past couple of years, at least, I've railed against Twitter as being a stupid, inane new fad, I've come to love it. And to use it, probably too often for my health. And I encourage you all to join up, as well, and to follow us. Because we'd appreciate it. And because it's fun. I'm following a whole slew of comics creators and celebrities at the moment, and I'll even occasionally "talk" with them. And that's cool. You know what else is cool? The new books out this week. So let's dive right in. 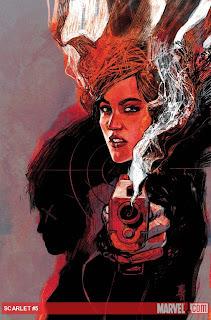 First up, from Marvel, we have Scarlet, issue five, from Brian Bendis and Alex Maleev. My goodness, but has this book been good. Easily my favorite Marvel title currently on the stands, Scarlet should be on your must-read list for 2011. Bendis is at his best here, telling a gritty, dialogue-driven story about a modern day revolutionary fighting against the injustices of society. And Maleev's art is astounding. Issue five will deal with the considerable fallout from last month's Holy Cats Issue, where Scarlet stood up and revealed herself in front of her gathered supporters. The Story: Scarlet’s message of rebellion and revolution has gone global, and she comes face-to-face with her supporters and detractors. What will the world look like when someone stands up and says, “Enough”? How far will the authorities go to bring her down, and is it too late? Another startling chapter in the runaway-hit comic series from the Eisner Award-winning team that brought you DAREDEVIL and NEW AVENGERS! Check this book out--it's two of today's best creators cranking out some of their very best comics. Next up, we have more of a recommendation to go back and read an entire series, as opposed to a recommendation to pick up this latest issue. 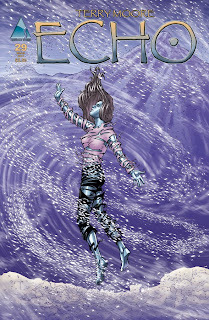 From the great Terry Moore, Echo, issue 29, ships today. We've talked about this series in the past, but stopped featuring the book here on WfW, mostly because I started to take it for granted. We should celebrate books like Echo, and creators like Moore, every chance that we get. Echo is the best sci-fi comic on the shelves, and today's issue 29 is the penultimate issue of the series. Which means, if you haven't been reading to this point, you're not gonna want to pick this one up. Instead, you should run out and buy the first trade, "Moon Lake," and see what all the critical acclaim is about. Because there's plenty of it. Critical acclaim, I mean. I've gone back and purchased all of the trades, and I'm really excited to see how the series wraps up. 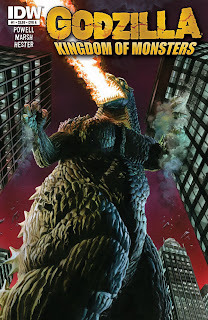 Moving right along, it's been too long since we've been able to talk about a new book by Eric Powell, but that stops today, as his new series, Godzilla: Kingdom of Monsters, hits shelves. Now, I'm not the world's biggest Godzilla fan, but I'll read anything that Powell's name is attached to, and that will be the case here. Powell's writing the series, and it's drawn by Phil Hester, so there's really no way the series won't be good. The King of the Monsters rises again, and for the first time in comics, he’s bringing lots of other beloved Toho monsters with him in one destructive saga, and The Goon’s Eric Powell is sounding the alarm. Powell will also paint covers for each issue of this new ongoing series, including a wraparound cover to kick things off! Acclaimed artist Phil Hester signs on for the first storyline, and Alex Ross supplies a painted 50/50 variant cover! This is the Big G storyline you’ve been waiting for! And, finally, what would a Waiting for Wednesday be these days without a couple of entries from Image Comics? The industry leader in awesome creator-owned work, Image unleashes to new number one's today that I'll be picking up. 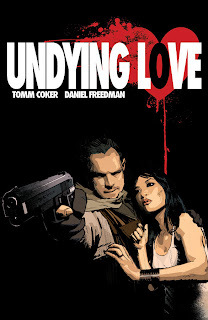 First, we have Undying Love, issue one, by Tomm Coker and Daniel Freedman. This one caught my eye in Previews, and a free preview of the book was printed in one of Image's other titles. 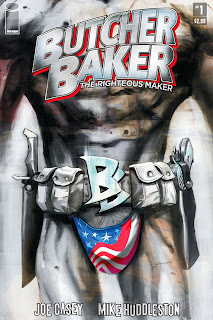 And the second Image book this week is Butcher Baker, the Righteous Maker, issue one, from Joe Casey and Mike Huddleston. Now, sure, we like to keep things PG around here, but that obviously doesn't mean we don't read and recommend mature readers titles. As you know, the vast majority of the books I recommend fall under that category. Still, I figured I'd give a head's up that this book is definitely not for the kiddies, as you'll see by the cover and the solicitation info, below. Despite the fact that Butcher has gotten quite a bit of press prior to its release, I expect it to be ordered in fairly conservative quantities by retailers, due to its mature content. Which, of course, is stupid. But retailers need to be conservative in times like this, I guess, so if you'd like a copy, I'd suggest calling ahead to reserve one. Sounds like something different and fun, and I'm looking forward to checking it out. And with that, I need to get a move on. Lots of work piling up, and a meeting in about 15 minutes. Yay. In any case, before I go, what are you Waiting for? Easter Break. Just 5 days of no school work, no obligations, and some staight up gaming and internet...ing. Mix in a couple of comics, too!